Dine at ‘Andrew Fairlie at Gleneagles’ highly coveted 2 Michelin Star restaurant or simply relax by the seashore with a plate of the finest, freshest Scottish seafood and a glass of Champagne. 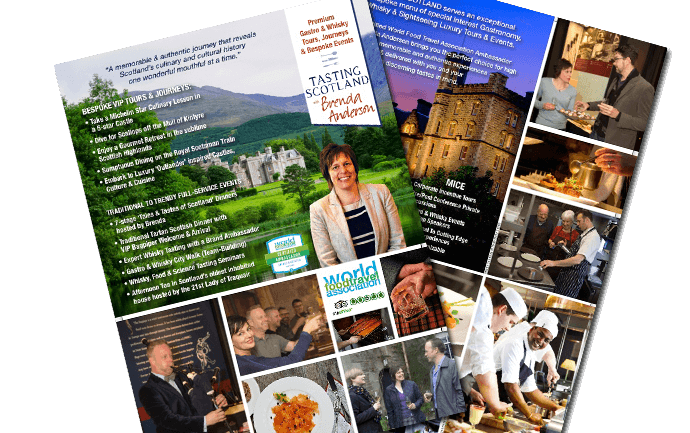 This itinerary offers you a real flavour of Scotland’s fascinating food and drink traditions along with a chance to experience modern cuisine innovations at the best tables in town. Your choice of 4 or 5 star accommodation including a castle stay, set within the Perthshire highlands and in charming and historic coastal St Andrews along with optional daily activities and must see attractions allows you to custom your perfect short break. OPTION 1 WHISKY & CULTURE Exclusive tour and tasting at the Glenturret/Famous Grouse Distillery. Create your own Whisky blend, bottle it and take it home • visit to the Battle of Bannockburn Heritage Centre, Stirling Castle or the William Wallace Monument. OPTION 2 THE HIGHLAND DUO – 4WD SAFARI & WORLD CLASS CHOCOLATIER Exclusive 4WD land rover highland safari with your own kilted ranger. Enjoy the glorious scenery and possible sightings of Scotland’s majestic red deer, famous grouse or soaring eagles • visit to the international award winning Iain Burnett Highland Chocolatier for an artisan chocolate tasting. OPTION 3 DEWARS WORLD OF WHISKY & THE HIGHLAND CHOCOLATIER CONNOSIEURS EXPERIENCE (Monday to Friday only) Since 1898 Aberfeldy Distillery has produced a single malt whisky, which lies at the heart of Dewar’s multi-award winning premium blends. Enjoy a special tour and tasting • exclusive ‘Connoisseurs tour and tasting’ with your specialist guide at the Scottish Chocolate Centre. Learn the art of chocolate tasting. Discover which chocolate suits your palate and why. Taste your way around the world of chocolate. OPTION 4 REST AND PLAY AT THE 5 STAR GLENEAGLES HOTEL One introductory lesson of your choice from/at the following: Falconry School, Gun Dog School or Equestrian Centre, Trout Fishing, Clay Pigeon or Air Rifle Shooting or Archery. (Also available with a supplementary charge applied include: Spa treatments, a round of Golf or a Wildlife Photography experience. Deer Stalking or Game Bird Shooting for experienced shots is available in season). OPTION 1 CRAFT ALE & A GOURMET EMPORIUM Enjoy a tour and craft ale tasting at a local St Andrews brewery • Call into the Balgove Larder, Café and Steak Barn, one of Scotland’s best food and drink emporiums. Stock up on Scottish delicacies or souvenirs. • call into the 2014 Scotland Farm Shop of the Year • enjoy a self-guided visit t0 a 17th century multi-varietal Castle Kitchen Garden. OPTION 3 WHISKY & ST ANDREWS enjoy a private whisky tasting in Luvians Bottle Shop in the heart of St Andrews • Soak up some of the town’s unique atmosphere. Enjoy a walk along the golden beach of West Sands, a haven for nature and wildlife or by the famous Old Course golf greens • Visit the 12th century medieval St Andrews Cathedral or enjoy a little shopping in family owned boutiques or professional golf shops. This experience is available on your choice of dates. All entrance fees, tours and tastings associated with planned itinerary, except where stated that supplementary charges apply. *Dining option upgrade (subject to availability) on Night 1 or 2 to sample either of the Tasting Menus below with/without matching wines in Scotland’s finest 2 Michelin Star restaurant, Andrew Fairlie at Gleneagles. Supplementary charges apply (per person). To book this Tour, please choose your accommodation option and click the Book Now button! Take advantage of a discounted rate on your car rental from our partner AVIS International by using the exclusive link on our Tasting Scotland website. (Standard or Prestige cars available).